Candor TechSpace, the leading provider of IT/ITES office spaces, hosted a special event to celebrate the International Day of Persons with Disabilities at Roseate House, Aerocity in New Delhi, on 28th November. The event saw distinguished persons from various walks of life engage in a stimulating dialogue on the role of infrastructure in facilitating the inclusion of people with disabilities and sensitizing the masses on the need for the same. The event hosted a few specially-abled achievers from across various domains, along with about several CEOs and top corporate executives. The event began with a panel discussion on the topic ‘Transformation towards Sustainable and Resilient Society for All’, wherein the speakers shared some extraordinary stories from their lives and their experiences of continually challenging the stereotypes associated with disability and their remarkable achievements in life. Among the panelists at the event was Ira Singhal, the first differently-abled woman to top the Civil Services exam in the general category. She is also the first physically challenged person to join the Indian Revenue Services. Internationally renowned table tennis player Suvarna Raj, who participated in the Asian Para Games 2014 in Korea and won two medals in the Thailand Para Table Tennis Open 2013, Dorodi Sharma Former Disability Rights Specialist, United Nations,Monitoring, Evaluation, Accountability and Learning Officer (MEAL Officer), International Disability Alliance, Nipun Malhotra – Co-founder and CEO, Nipman Foundation (A Foundation for health and advocacy for persons with disabilities) and Mr Vittalkumar A Dhage – VP, Sustainability, Accenture Workplace solution were also a part of the panel. 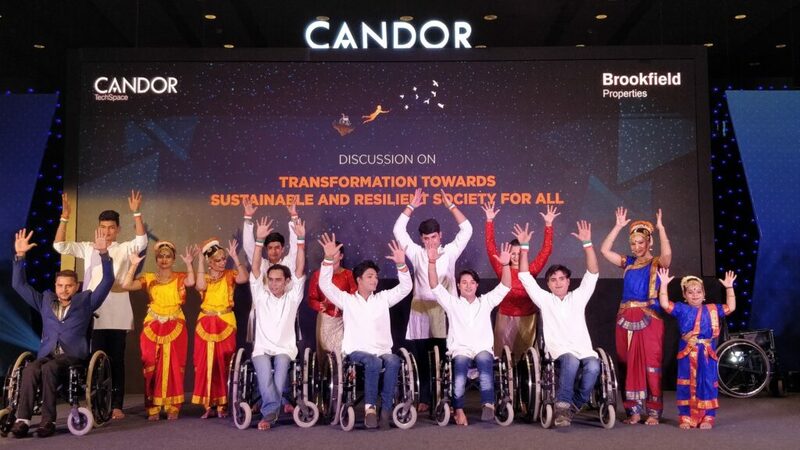 To further celebrate the extraordinary abilities of differently-abled people, the panel discussion was followed by a beautiful performance act by “We Are One”, a differently abled group consisting of wheelchair users and hearing & speech-impaired artists. The group has the unique distinction of having a “Guinness Book of World Record” under its belt. Taking forward the legacy of its parent company Brookfield Properties, Candor TechSpace has emerged as a prominent name in the business space and workspace solution provider segment, offering built-to-suit and customizable state-of-the-art office spaces with superior landscaping and world-class amenities. Its vast clientele includes top global companies such as Amazon, Accenture, Barclays, Genpact, Mercer, Aricent, Alight, Evalueserve, Sapient, Fidelity, TCS, Capgemini, and Cognizant, among others.